Back in 1993, Peter Andersson unleashed an album on the world which would be one of the benchmarks for dark ambient, a genre that was still in its infancy at the time. Sure, other artists had been pushing slowly in this direction as well. Delerium was fresh off their release of Stone Tower an album which must have had a decent bit of influence on Peter Andersson, who followed closely to their template but took it into a darker and more subtle place. A place devoid of the front and center percussion heard in Delerium. The classic Heresy by Lustmord was still just making waves across the scene. Into this landscape, enter raison d’être. raison d’être clearly can’t be credited with starting the dark ambient genre. While still quite primordial, dark ambient already had about ten years worth of experimentation under its belt before Prospectus I hit the shelves, through the legendary Cold Meat Industry label. However, CMI did already have a name for themselves. So when Prospectus I released, it immediately found an audience. Fans ears perked up, maybe for the first time, as they heard an album which would change the face of the genre. Lustmord through the proceeding years had been going for a sinister sort of feel. Heresy is wrought with some downright horrifying moments. raison d’être flipped the script, presenting an album which shared equal parts beauty and darkness. The sacral vocals incorporated throughout the album would not only become a trademark of the raison d’être sound. They would be tested and refined by many other artists even to this day. Whether any of them have ever reached the glory of this early release is a question that is absolutely debatable. Adding upon the sacral vocals, which are such a defining part of their sound, raison d’être dug even deeper into this contrast between the light and dark. “Ordeal In Chapel” may be the most beautiful track on Prospectus I. On “Ordeal In Chapel” we hear and feel our surroundings in this chapel. Chanting is the dominate characteristic with a bell tolling in the background. Gently droning synths hold the majority of the track together, before fading out toward the end, as the track progresses further into the darkness. On “Ascension De Profundis” we are given a reasonably calm backdrop, with the sounds of church bells tolling. But these pleasant sounds are betrayed by the repeated phrase “The Holy Father”, and a sacral chanting sample which repeats throughout the track in an unsettling and decidedly eerie manner. The icing on this cake is an extremely well placed industrial sort of drum beat, which, while being quite pronounced in the track, doesn’t shatter the atmosphere, as is the case so often in dark ambient albums with percussion. Again on “Cenotaphium” we hear this brilliant use of industrial percussion, adding to the depth, yet allowing for continued immersion. Also of particular note, is the final track “Penumbra” which does break the immersion of the listener a bit, but not to a negative effect. Something that sounds almost like a violin, but is much more likely a heavily treated synth, cuts into the mix with its high-pitched notes. Following this is a clear and abrupt synth line, which meanders almost playfully through the track, taking on an Atomine Elektrine feel. Yet, with much of the album, this lighthearted side doesn’t last forever. We are slowly inundated with a pulsating sound which could almost be a human voice, but sounds quite demonic. A dreamier, yet fear inducing, synth line falls into the mix. On its tail is some serious use of industrial field recordings, which become more dominant as the track proceeds. By the end of “Penumbra”, we can hear a plethora of field recordings which all come together in a cinematic manner which might not be used so successfully again on a dark ambient album, until the coming of Atrium Carceri in the mid-2000s. While raison d’être didn’t form a genre with this album, he did succeed in bringing a more peaceful, yet simultaneously eerie and irreligious release to the forefront of the CMI scene. The sense of beauty within the darkness cannot be overstated. One gets a feeling of religious nostalgia, simultaneously with a sense of the corruption on the part of Christianity. Light and dark are two sides of the same coin, and raison d’être is one of the best at blurring the lines between these two sides. Prospectus I has proven over the last 22 odd years that it is indeed a classic. As a fan who came into the genre much later, it is absolutely necessary to look back to the beginning, not only to see where the genre came from, but also to realize that some of these classic releases truly stand the test of time and would be just as welcome to the scene today as they were two decades ago. Looking reverently back on the early albums of the 80s and 90s as if digging the dirt off the remains of an illustrious ancient civilization, there are few other artists that can bring out such emotion as raison d’être. Peter Andersson would refine and expand upon the template set in Prospectus I to build one of the most successful careers in the dark ambient scene. This album is an absolute must for any dark ambient fan who looks back over the history of the genre and doesn’t know where to start. 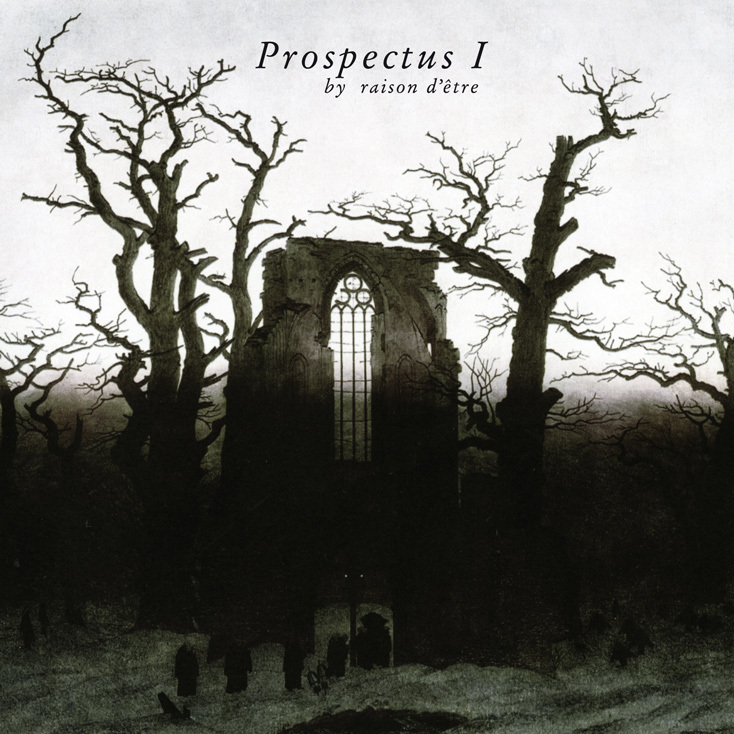 Prospectus I is truly a classic and an early masterpiece of dark ambient. raison d’être has recently restored, re-recorded and mixed Prospectus I. Check the “Re-release Label” links at the top or click on the Bandcamp player for information on purchasing this redux version of Prospectus I.